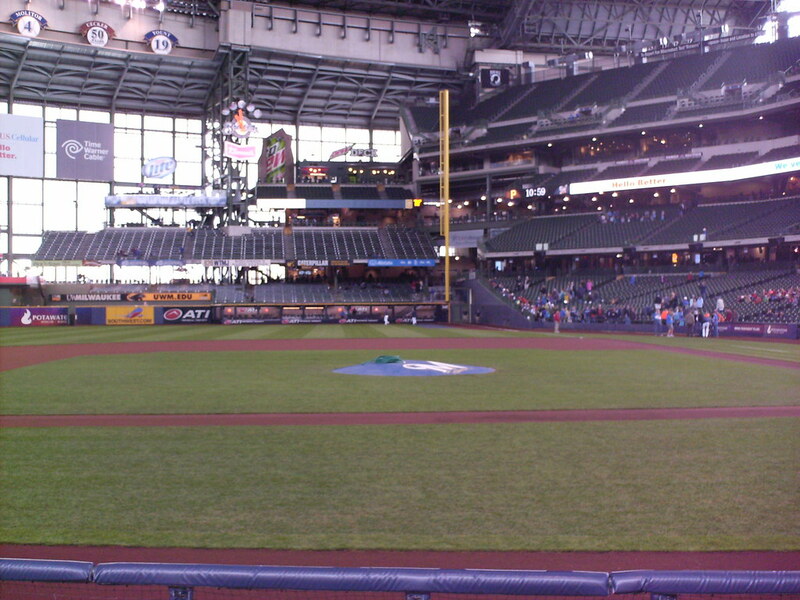 The view from behind home plate at Miller Park. 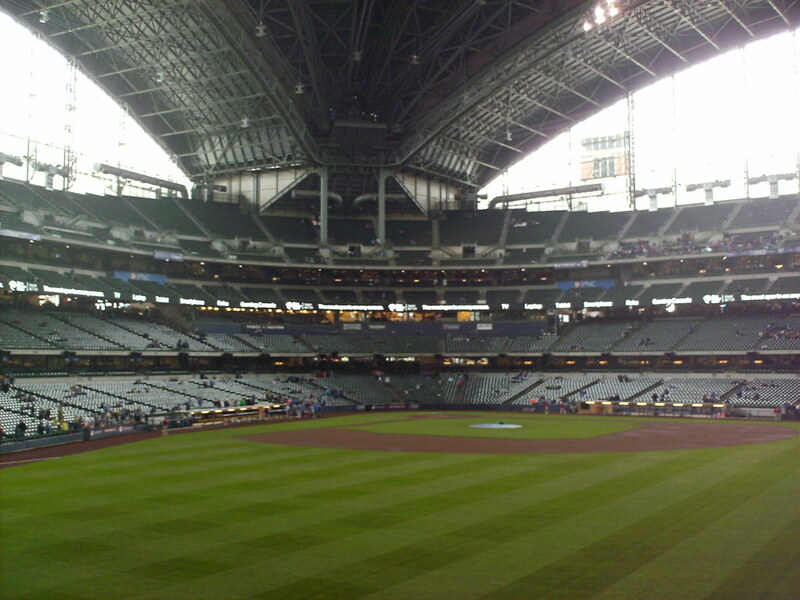 The Miller Park grandstand, as seen from center field. 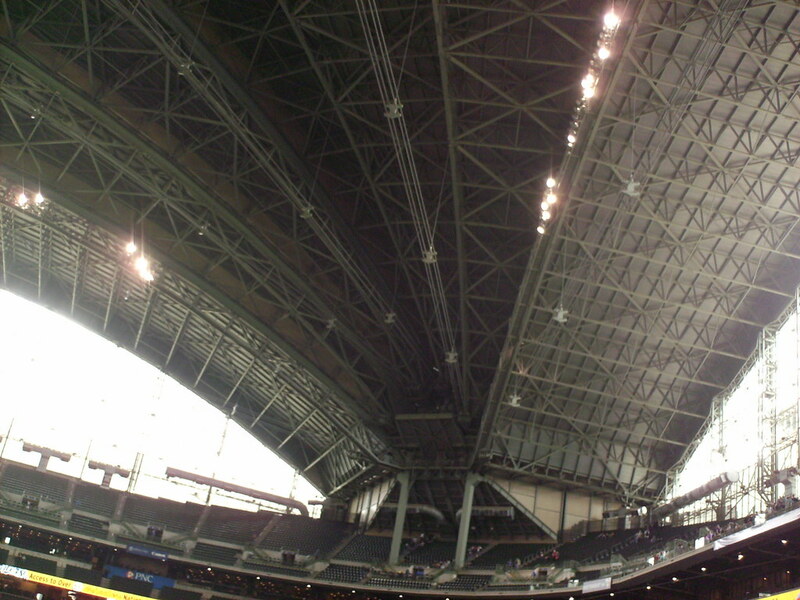 The retractable roof opens like a fan from a point behind home plate. 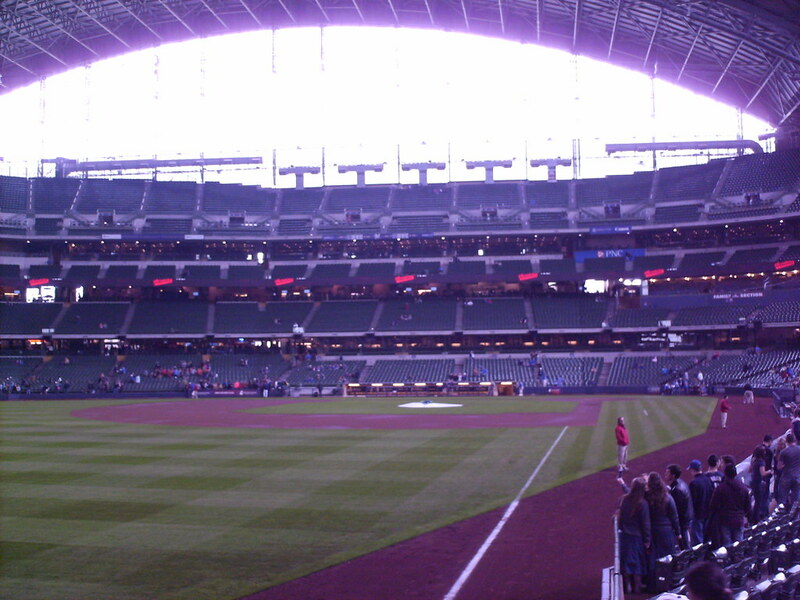 Large windows down each foul line let light into the ballpark even on days when the roof is closed. 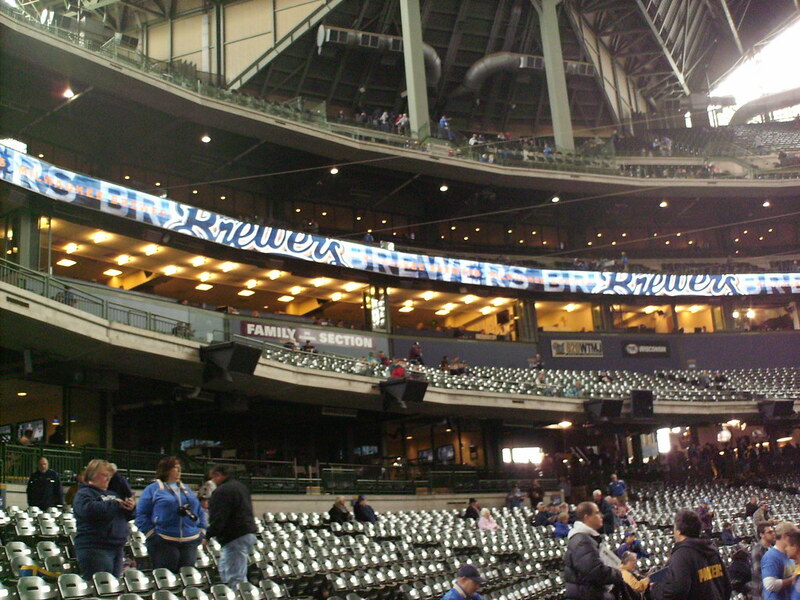 Two more large windows, and Brewers retired numbers, flank the scoreboard in center field. 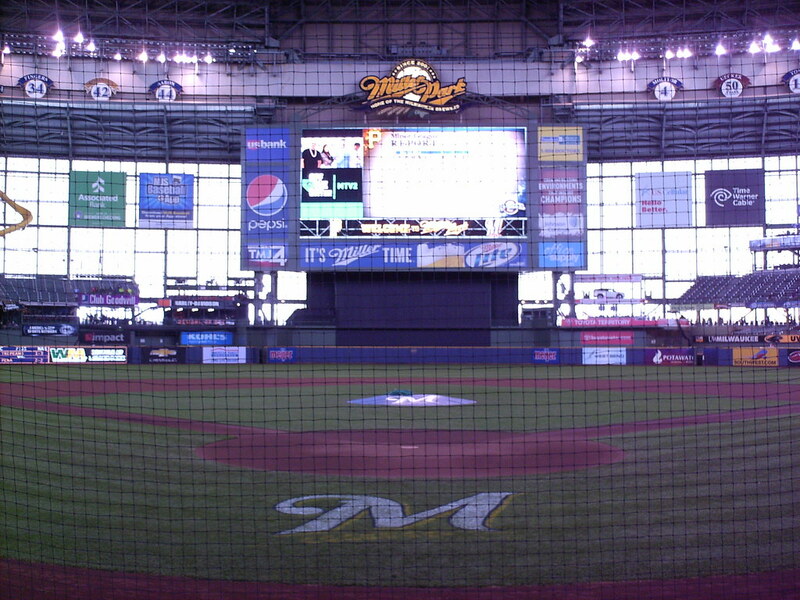 The pressbox behind home plate at Miller Park. 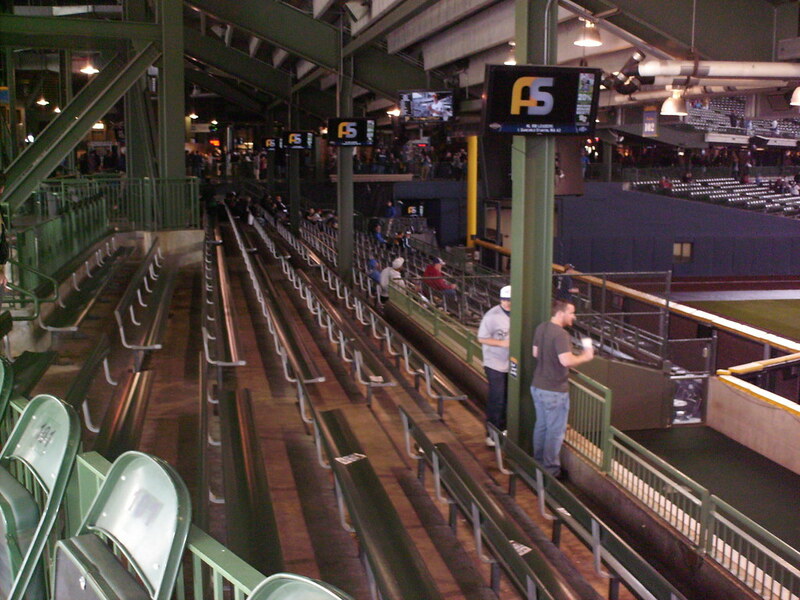 The four seating levels in the main grandstand, as seen from the upper deck. 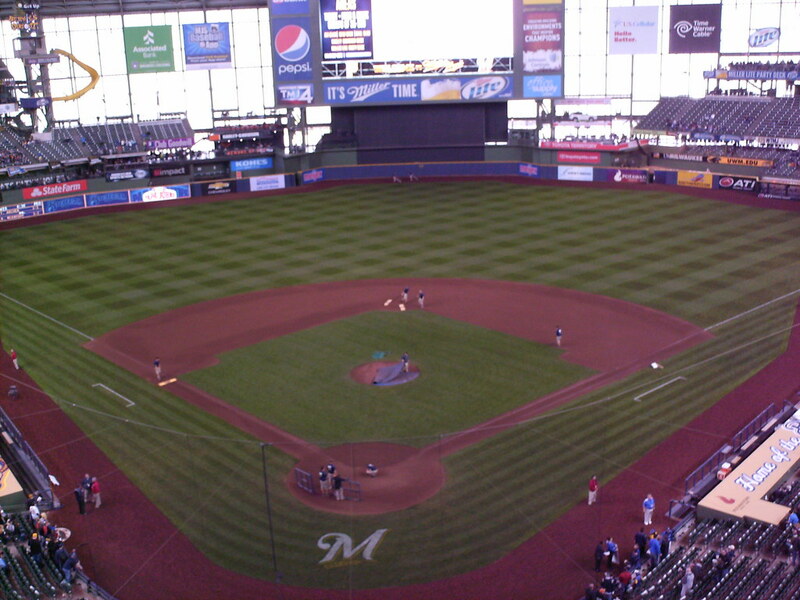 The playing field at Miller Park, as seen from the upper deck. 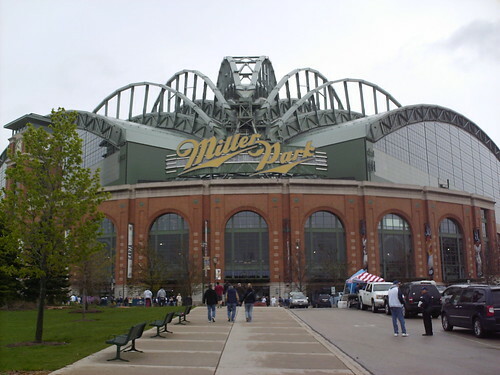 The park features two levels of luxury suites. 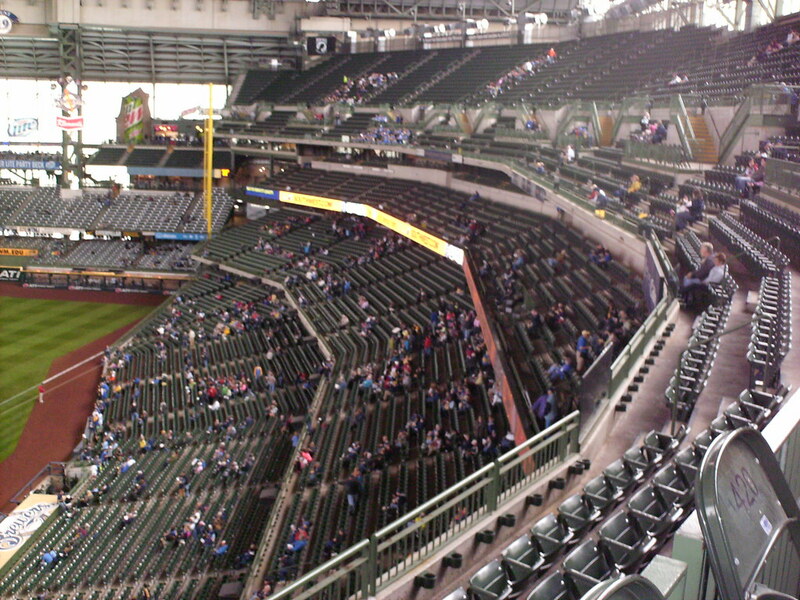 One in the customary position under the upper deck, and one closer to the field on top of the first level of seating. 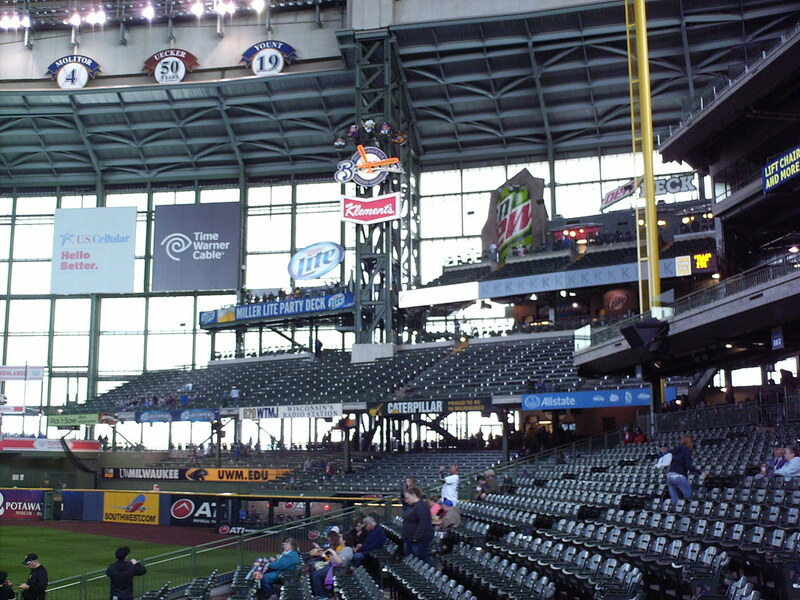 Party decks and bleacher seating underneath the clock in the right field corner. 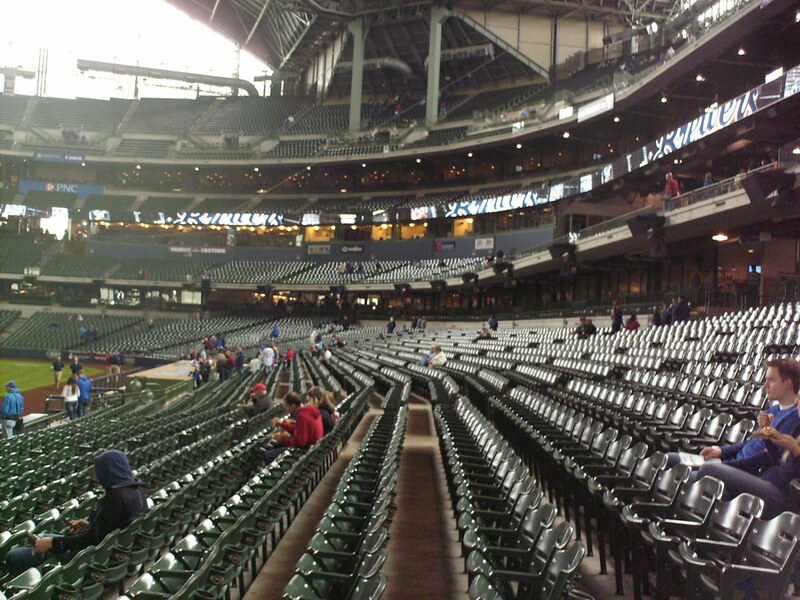 Bleacher seats underneath the second deck in right field feature television monitors. 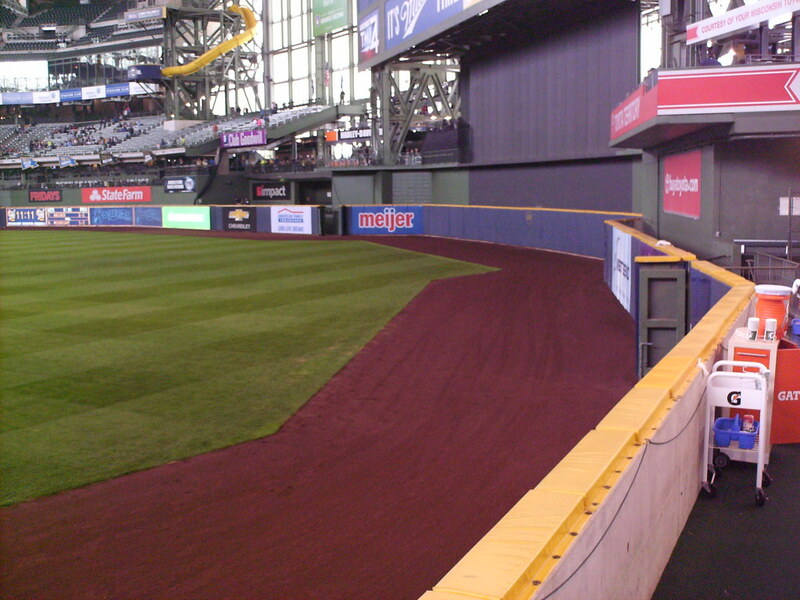 Bar top seating juts out into the field of play, in front of the right field bleachers and next to the bullpen. 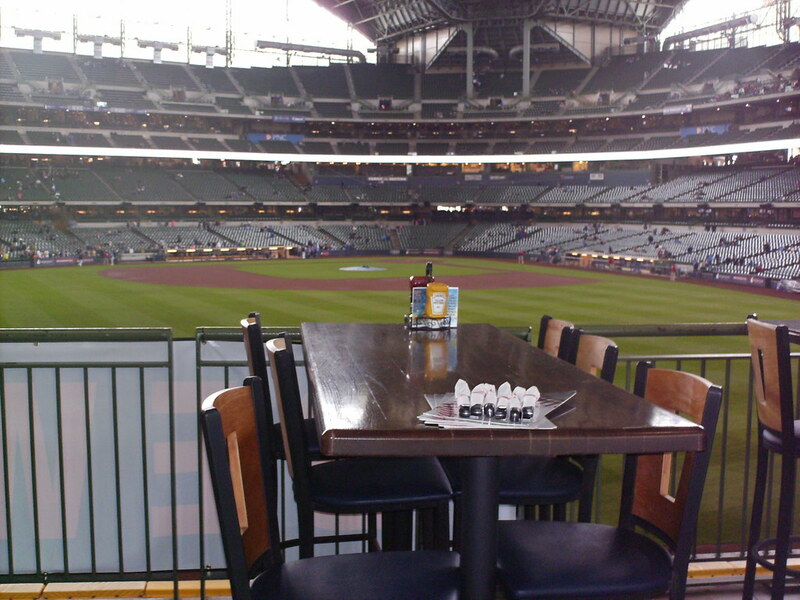 Table seating overlooks the field from the concourse in left center field. 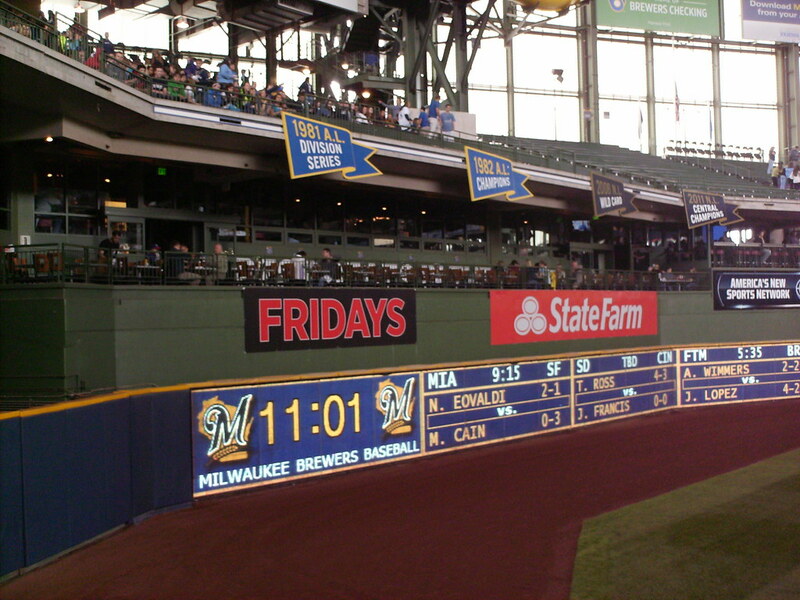 Restaurant seating and Brewers championship pennants overlook the field from atop the out of town scoreboard in left field. 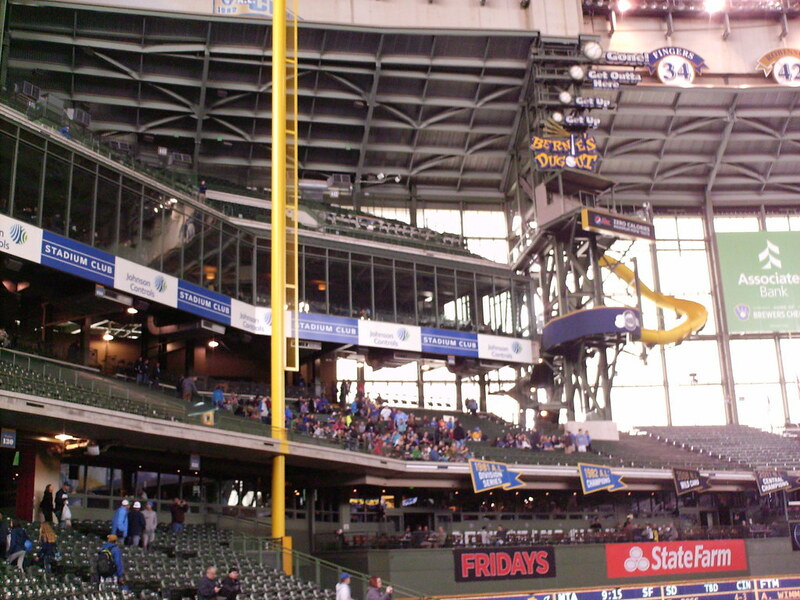 The enclosed Stadium Club area wraps around the left field foul pole. 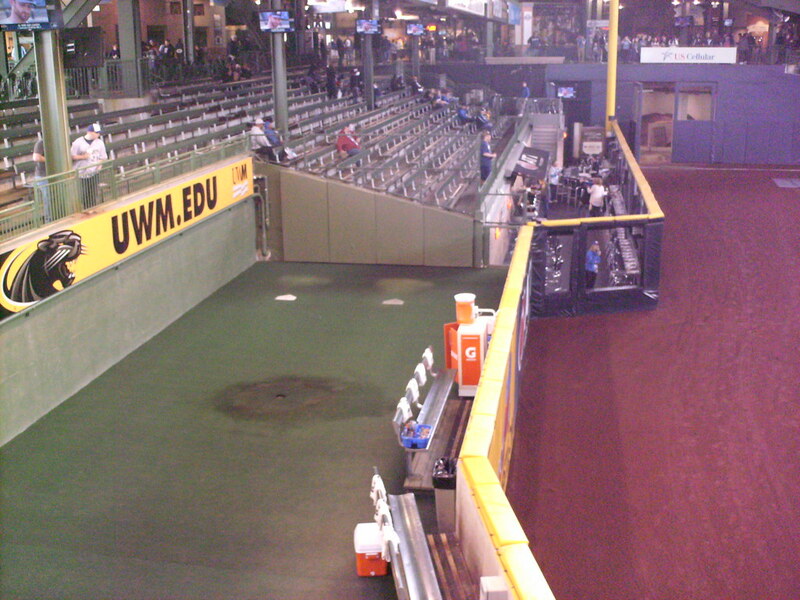 Bernie Brewer's Dugout sits high above the field in the left field corner. 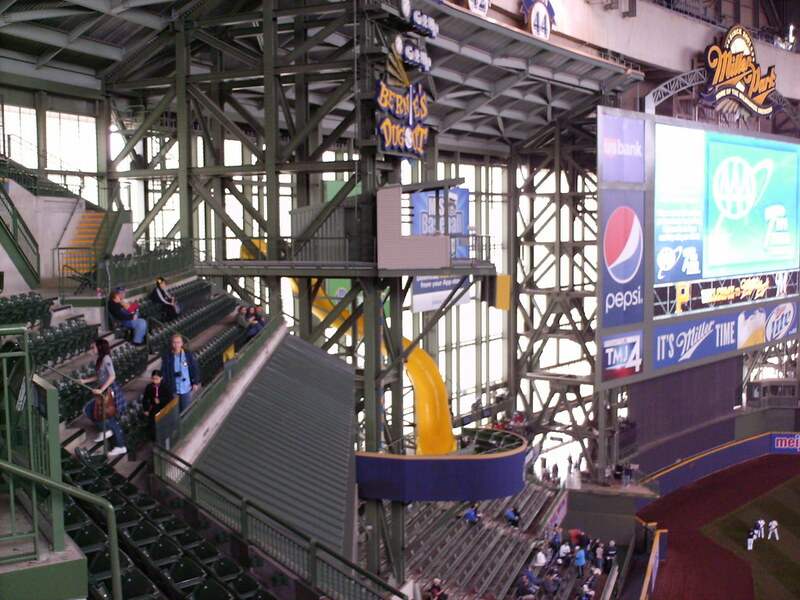 When the Brewers hit a home run, the Brewers mascot emerges and slides down the slide as fireworks explode over the field. 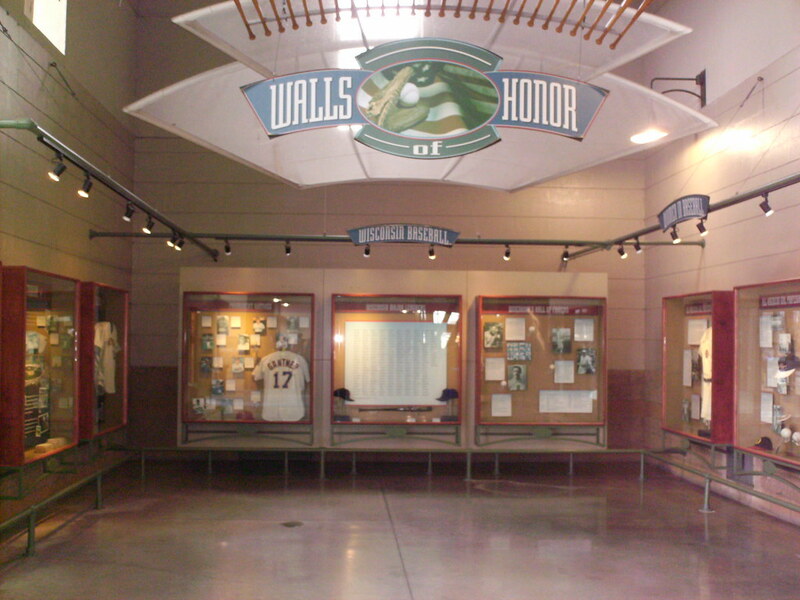 Plaques in the Miller Park concourse celebrate the history of baseball in the area. 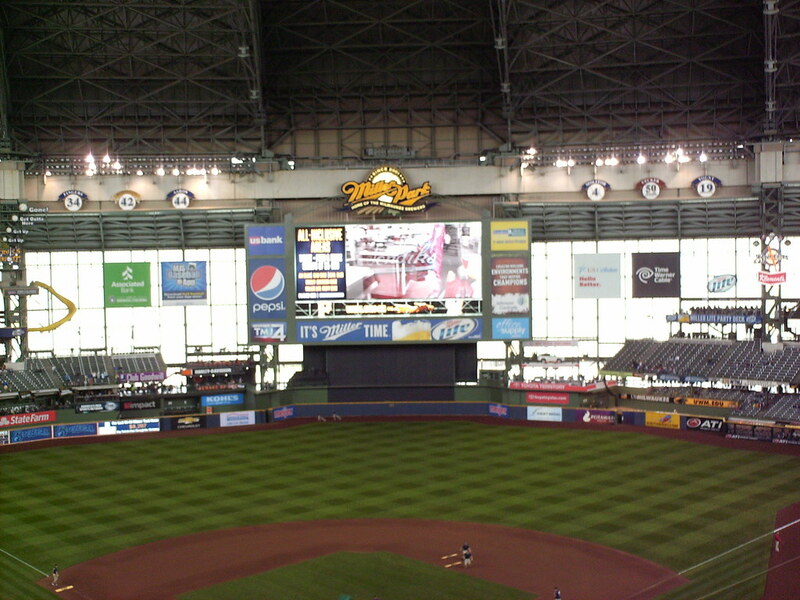 The outfield wall is deeper in center field, creating an alcove underneath the scoreboard. 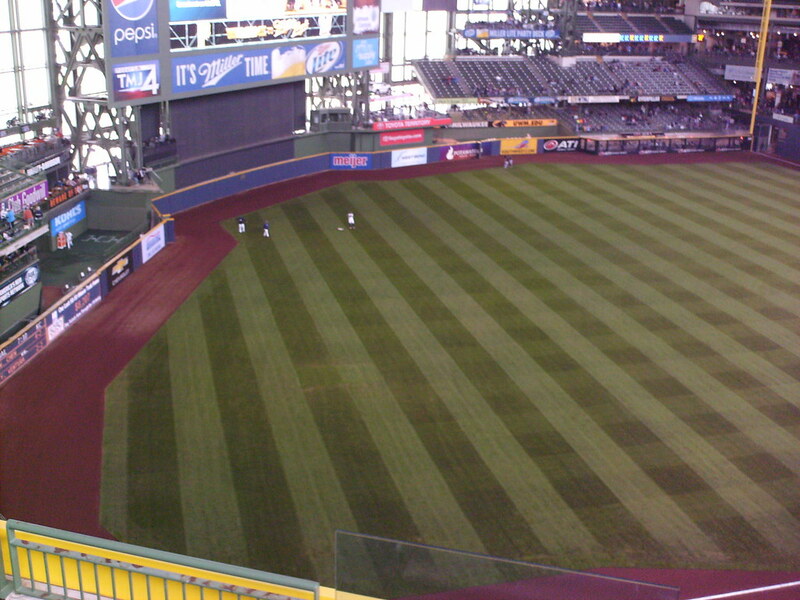 The angles and corners of the outfield wall as seen from the upper deck. 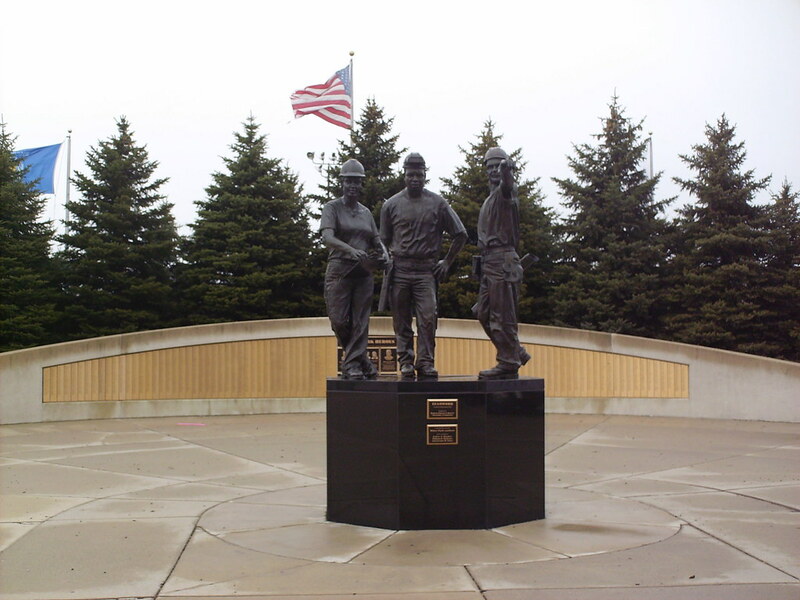 A statue outside the park honors the construction workers killed when a crane collapsed during the construction of Miller Park. 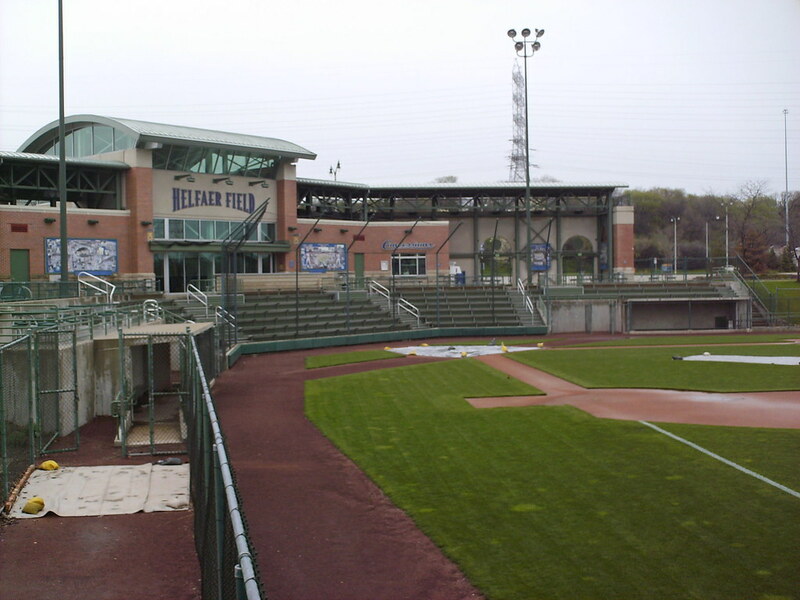 Helfaer Field, a youth ballpark, sits just outside the major league park, on the site where Milwaukee County Stadium once stood. 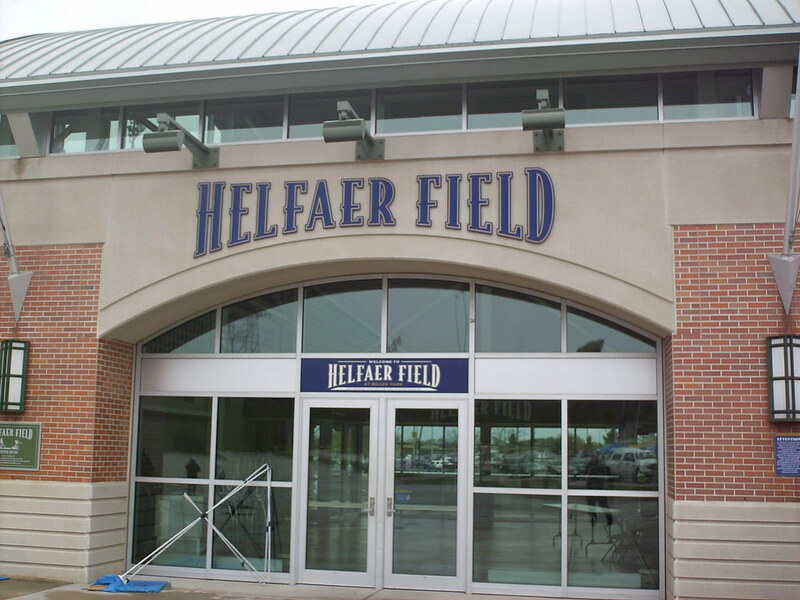 The grandstand and playing field at Helfaer Field. 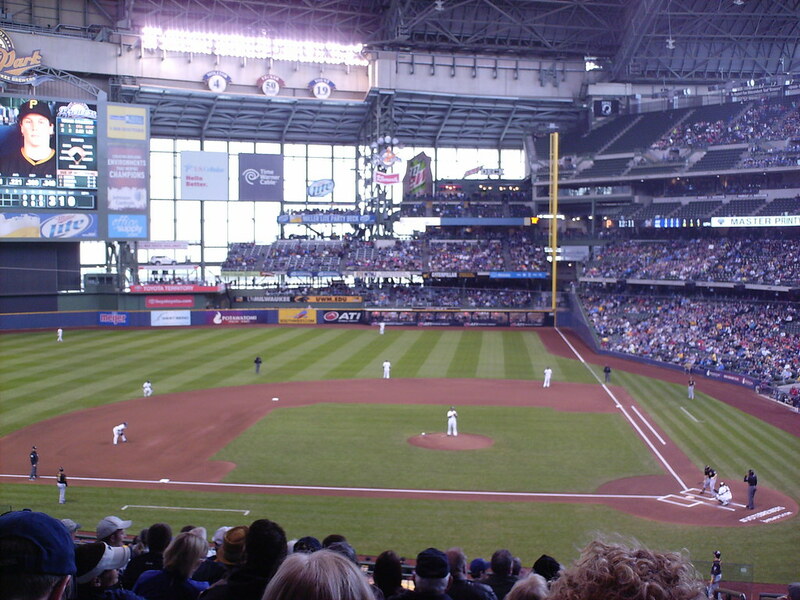 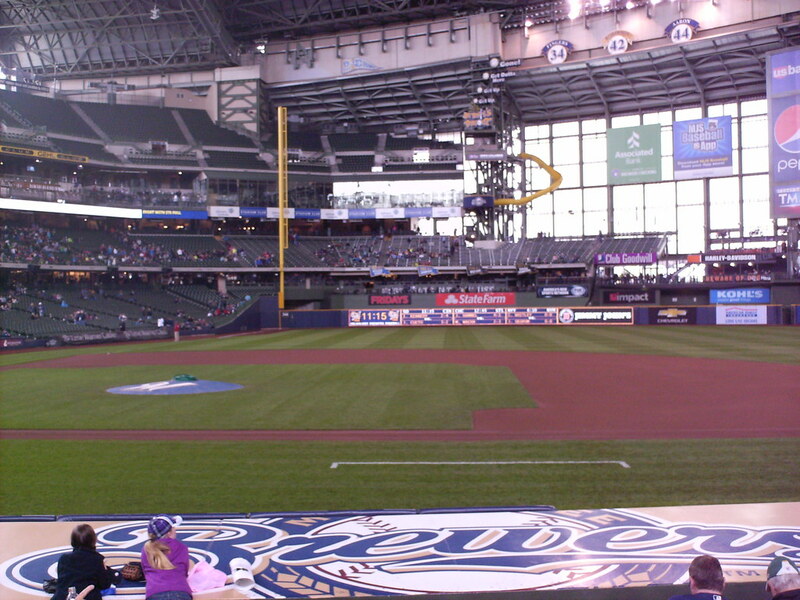 The Milwaukee Brewers on the field during a game at Miller Park.